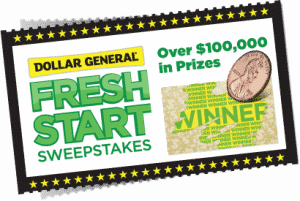 Click here to visit the Dollar General site and register. On the next page you’ll then be able to play their instant win game. 3,300 will instantly win a $10 Dollar General gift card. Even if you don’t win, you’ll still be entered into a drawing for larger prizes including a $1,000 check, $10,000 check, and the grand prize of $50,000. You can enter daily through January 27th. Good luck!